This entrance to historic Firemen's Angell Park is located on eastbound Park Street, at its intersection with Miller Drive, Sun Prairie, Wisconsin 53590. 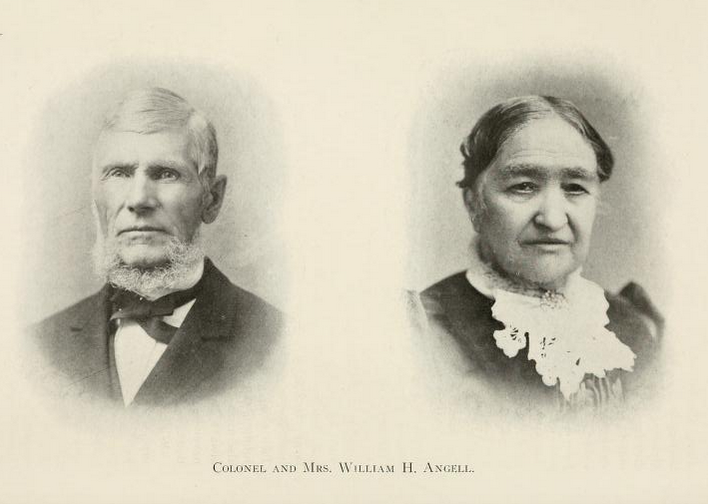 William Angell was a pioneer settler of Wisconsin, arriving about four years before Wisconsin received statehood. He was the first president of Sun Prairie. Colonel Angell was described as "liberal, generous and public-spirited, fair and honorable in all the relations of life and expecting the same attitude of the part of others, and he has the unqualified esteem of the entire community in which he has so long lived and labored and which owes so much to his interposition. He gave nine acres of land in the village to the fire department, the same to constitute a public park, the dedication of the park occurring on his birthday anniversary, June 20, 1903, and being a notable public event in the locality. The Colonel secured his title from able service as lieutenant colonel in the Vermont militia. His father served in the Continental line in the War of the Revolution, having enlisted when he was but fourteen years of age. The foregoing adapted text is in the public domain. G. Campbell & Sons, Milwaukee, Wis.
the images are in the public domain. The Sweet Corn Festival, held annually in August.